JDisplay It started out as a way to display Java source code listings in a variety of colours, fonts, sizes and weights to help make them more presentable and readable on a website. Then I expanded it to handle HTML (Hypertext Markup Language), bat, btm, SQL (Standard Query Language), ini, csv and *.properties files. Then I expanded it further the handle mft, sf, mf and http files. Why would you use it? For the same sorts of reasons you use colours and fonts in an IDE (Integrated Development Environment) like IntelliJ or Eclipse. They make your code much easier to understand for visitors to your website. The techniques used are more much more efficient of bandwidth than displaying images. using a Java Applet. This is usually best for very large listings. as piece of CSS (Cascading Style Sheets) style-decorated HTML code you include in your html as an iframe. This is usually best for intermediate listings. inline in your HTML. This is usually best for short listings. The problem, in the process of editing the html it is fairly easy to damage the generated listings. They must be regenerated before every upload. I have been using the JDisplay suite of utilities for many years. I did not write it for public use. I offer it on an as-is basis. The code itself in well documented, but there is no step-by-step documentation on getting it to work. I presume the user is familiar with bat and ant files and Java building. I have not included the enormous HTML static macros package which I use for deciding the sizes and display rendering method for each snippet, though I did include the code to make those decisions hooked into your own framework. At some point in the near future I will make the htmlmacros package available for download separately. The parsers are rough and ready. They need to work on code snippets and erroneous code, not perfect code the way a standard parser does. If improve the parsers, or add new ones, please pass them along for the public distribution. You can render three different ways: Applet, inline, or iframe. uses CSS not old-fashioned <font tags. works on snippets with syntax errors. has parsers for HTML, SQL etc, not just Java. 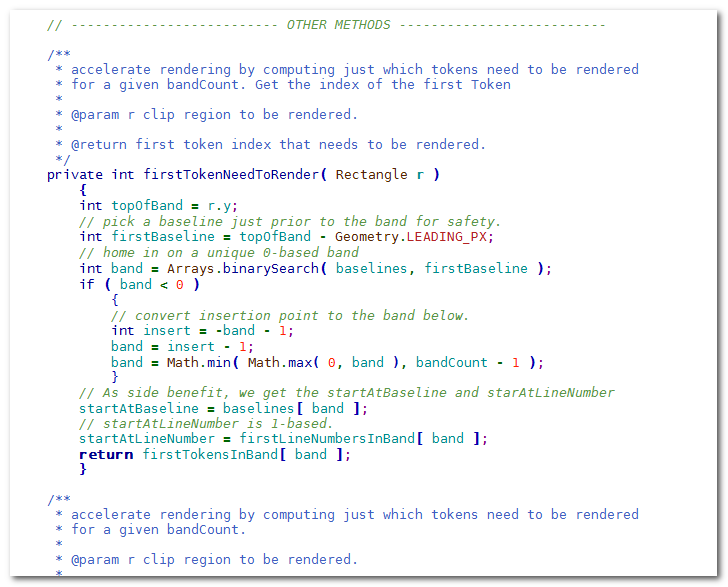 it has been extended by a third party to colourise code snippets in Javadoc. For large listings, with Applet rendering, it is more efficient than HTML since it transmits a compressed binary token stream. com.mindprod.compactor compacts html to remove excess white space. com.mindprod.entities interconvert & ⇔ &amp; etc. com.mindprod.htmlmacros jdisplay.java part of a large static macros package to expand macros embedded in HTML before the files are uploaded to the server. com.mindprod.hunkio does IO in big hunks. com.mindprod.jdisplayaux static macro to decide which of three ways to render a given snippet and inserts the appropriate HTML to do that into your HTML. com.mindprod.jdisplayorphans detects orphans not referenced by any of your HTML. com.mindprod.jprep parses the snippets of code, producing binary *.ser files. com.mindprod.jtokens Tokens and parsers for various languages rendered. Run jprep to parse snippets to binary *.ser files and iframe/*.html files. Manually decide which of three methods to use and insert the appropriate HTML. (or rig up some code to do this automatically using code in JDisplayAux). To see what the embedded HTML looks like see Java Presenter Student Project which describes how JDisplay works inside. This HTML was generated with static macros. You might do the same, or compose the embedded HTML directly. View code inline, as iframe, or via invocation of JDisplay Applet. For this Applet to work, you must click grant/accept/always run on this site/I accept the risk to give it permission to let it read the decorated text to display from a file on the server. If you refuse to grant permission, the program may crash with an inscrutable stack dump on the console complaining about AccessController.checkPermission. All off this must be uploaded to your website. All code should be included with the exception of the htmlmacros package. If you find something missing you can probably download it. In any case, please let me know, so I can include it. If you have questions, please feel free to ask at . It will help me put together some minimalist documentation. If you are interested in using JDisplay in other contexts (e.g. without htmlmacros), I will be willing to help and write interfacing code at no charge. One PhD student from Germany has used JDisplay to automatically colourise source code listings embedded in Javadoc. He has not yet publicly released the code. I wrote JDisplay originally primarily to demonstrate my vision of the future of what program listings should look like in advanced editors that I call SCIDs. I would love to see JDisplay-like logic in an IDE editor.